A few years ago, a palliative care nurse made headlines when she revealed the five things that people regret the most. Bronnie Ware, the Australian nurse behind the list, shared the musings of her patients on her blog and later compiled them in a book titled The Top Five Regrets of the Dying. At the top of the list is pleasing others at the expense of not being true to one’s self. The second, which is shared by most of Ware’s male patients, is spending too much time on work and not with family. The third is the unwillingness to express one’s feelings to avoid conflict. The fourth is staying out of touch with friends. The last is sacrificing long-term happiness by not leaving one’s comfort zone. The fear of living with regrets has led many people to adopt mantras like ‘carpe diem’ or YOLO (acronym for ‘you only live once’), as the millennials would say. For some people, it takes a doomsday prophecy to make them realize that the clock is ticking. Though such prophecies have been proven false, many still believe that the apocalypse is just around the corner and will end all life as we know it. This is the premise in the television series No Tomorrow. Convinced that an asteroid will hit Earth in eight months, Xavier Holliday (Joshua Sasse) comes up with a bucket list, what he calls his Apocalyst, of things to do before the world’s supposed end. As the series progresses, Xavier encourages Evie Covington (Tori Anderson), a bored warehouse middle-manager, to go after the things that matter to her. Evie later declares, “I need something different, something that combines everything that I'm passionate about.” She then goes on a solo trip to see the Northern Lights, moves to the Philippines, and pursues her dream job. A mindset like Xavier’s has its benefits. Dr. Nathan A. Heflick, a senior lecturer at the University of Lincoln, pointed out that this mentality can result to shifts in how people spend time, appreciate life, and view happiness. This is especially true for people who have been diagnosed with terminal illnesses. For aging people, a YOLO mindset helps them focus more on positivity instead of unpleasant things. Heflick warned that YOLO tends to be associated with unrestrained behavior. To prove this point, he recalled the incidents of a drunk driver tweeting YOLO before a car crash. Heflick added that the thoughts of death can push some people to engage in reckless behavior instead of being more cautious. The rise of this mentality is also evident in the increase of YOLO purchases in the UK, which reach up to 5 million every day, according to the UK’s Money Advice Service. Eric Barker, author of the blog Barking Up the Wrong Tree said that people should avoid worrying, dwelling too much on options, and comparing themselves to others. The quest for a happy life has sometimes blurred the line between boldness and outright recklessness. For life coaches like Dr. Stacia Pierce, taking risks encourages creativity, establishes new limits, and opens up new opportunities. Taking risks with careful thought, however, helps people determine if the reward at stake is really worth the chance. Dr. Karl A. Pillemer, author of 30 Lessons on Living, discussed five “secrets” for a life without major regrets: choosing a partner with extreme care, staying honest, travelling more, worrying less, and speaking out. Speaking of the last point, Evie eventually calls Xavier out when he starts pushing her too much on making each day count: “Maybe you helped me learn to seize the day, but I will be seizing it in my own pace, thank you very much.” Her words serve as a piece of wisdom on how calculated risks lead people to the kind of happiness they won’t regret pursuing. 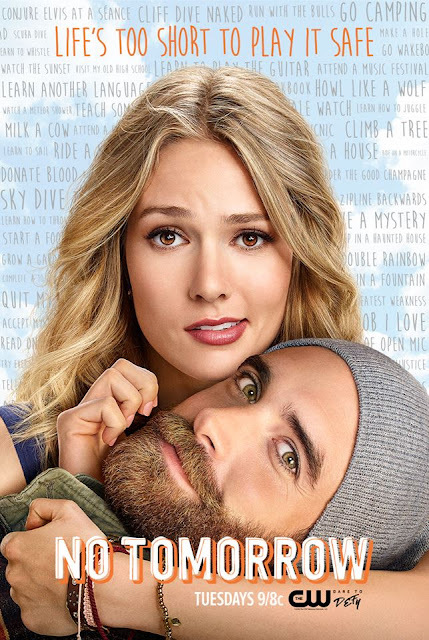 No Tomorrow Season 1 premieres in the Friday Night Fun block February 10, Friday, 9:30 PM, first and exclusive on RTL CBS Entertainment.